The building & home / smart infrastructure domain is usually covered by standard systems designed to manage building energy, environmental conditions and building security. The systems are usually provided by different vendors and can also be integrated together to provide the desired functionality. Systems available on the market also incorporate wireless links, but they are used rather to substitute their wired counterparts than to provide new system functionalities. One of the major challenges in smart infrastructures such as home and buildings is the integration of applications that have a wide range of requirements. Current wireless solutions are based on best-effort Wifi networks, and control of the network quality ends at the termination in the home. However, novel devices and services require controlled and secured access. Examples of such devices and services are energy control, health- and welfare-integration, and electric/hybrid cars. New classes of wireless systems in the building & home / smart infrastructure domain will be using wireless technology in more extensive ways and assume that apart from a standard functionality they will also enable additional functionalities to the building ecosystem. A good example is the wireless lighting system developed by Philips, able to control up to 250 light sources in a single network that can also provide an additional communication network for other devices or a wireless positioning system, used to track valuable assets within the building. Use cases developed within the different domains of the DEWI project as well as the workshops conducted together with the nSHIELD project, clearly indicate that reaching a higher TRL of particular wireless systems forming the DEWI bubbles. A successful launch of the product to the global market requires not only dependable but also secure and trustable wireless systems, as security and privacy are very important IoT topics from both end-users and regulatory/standardization bodies perspective. Another important outcome of the DEWI project is that properly designed and connected wireless systems can provide significant added value to end-users by enabling new cross-system and even cross-domain applications. Nowadays, facility managers require utilizing as many information sources as possible for environment sensing within the whole buildings’ areas. Particularly industrial facilities usually cover broad areas with buildings, roads, parking areas etc. with defined traffic and access rules which allows to compare them to a small city. The cross-domain collaboration between wireless systems gives the unique possibility for European companies to precede the available on-the-market solutions for areas where building systems (i.e. smart lighting, air quality, maintenance) within the building can interplay with the systems in a building’s close perimeter (i.e. vehicle access control systems, surveillance) and with automotive systems (i.e. access control to a car, V2x communication). Such a combination will allow in the not so distant future to design high-value added (to end-users), comprehensive and sophisticated systems that otherwise would not be available on the market for a long time since they would be much too expensive. Demonstrable secure wireless systems capable to be easily interconnected to provide cross-domain applications through providing measureable security for at least 15 applications. Insight into 1000+ smart buildings, through a cloud platform using open standards (e.g. TR-069) to monitor connectivity inside the smart infrastructures. 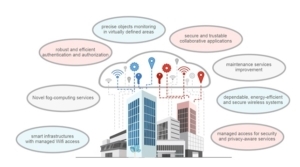 A demonstration with at least 500 smart buildings using managed wireless access, providing at least 80% of the delivered bandwidth to wireless users of the infrastructure. The extension of managed wireless towards differentiated access, to be demonstrated for at least 10 novel services. A set of guidelines for ‘privacy labelling’ (A++, A+, A, B …F) of apps, in agreement with at least one national authority (“Consumer Services”). Through SCOTT we will provide solutions for the requirements of automotive and health applications in smart homes/buildings, and foster the basis for 5G services, e.g. voice over WLAN and security-aware access.